The Monticello 24 foot Shade Cloth Kit is specifically designed for the Monticello line of greenhouses (24ft greenhouses). The design is simple, unique and thoughtful. Most shade cloths go on the outside of the greenhouse, interfering with roof vent and side window functioning. They are bulky and not easy to set up or take down. The Monticello Shade Cloth kit comes ready to use, no grommet installation needed. The commercial grade shade cloth (rated at 63%) works off a specially designed commercial grade wire system guaranteed to last for 7 years. The shade cloth comes in 4 foot sections so it will work with our Automatic Watering system and since the shade cloth is on the inside, it will not interfere with the Monticello Automatic Vent openers allowing fresh air to flow in and out un impeded. To operate the Shade Cloth System is as easy as pulling the cloth back to open or pulling tight to the other side to close. 8 ft. X 8 ft. Aluminum Greenhouse Not all greenhouses are built the same and the Monticello line of greenhouses by Riverstone Industries proves this to be true. Constructed from the highest quality extruded aluminum (US grade) and coated as not to discolour over the years (containing 0.0% lead), our greenhouse uses on average more than 40 lbs. more aluminum than the average imported greenhouse. Why is this important? The weaker the framework the less snow the greenhouse can hold in the winter time before collapsing and the easier it is to get damaged by the wind. While most hobby greenhouses use less expensive thinner walls and roofing materials, the Monticello uses professional grade 8mm twin wall polycarbonate. This acts as a double pain window keeping cooler air in during warm months and insulating the greenhouse from cold air in the wintertime; making the Monticello more efficient to grow in for a longer period of time and adds to the efficiency of growing. 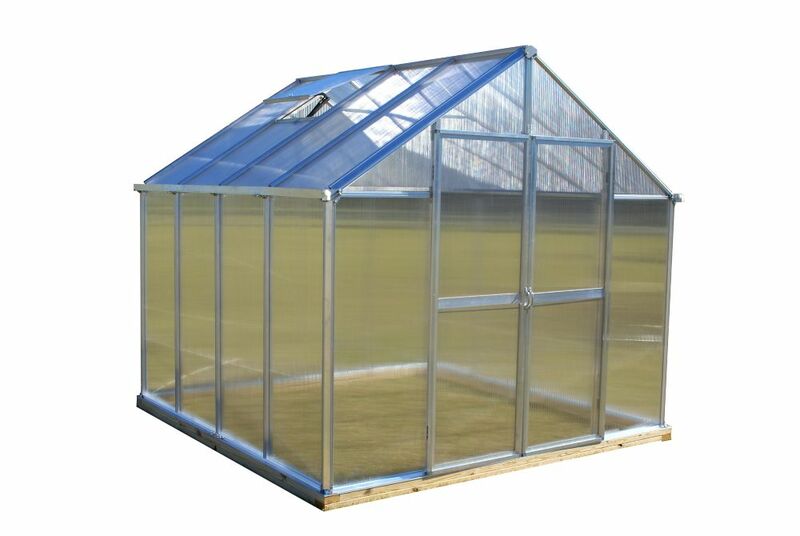 8 ft. X 8 ft. Aluminum Greenhouse is rated 5.0 out of 5 by 1. Rated 5 out of 5 by Jamesontherun from Super sturdy and attractive greenhouse We now have fresh vegetables in about two thirds the time it would have outdoors. The bright aluminum finish is very modern and looks great in our back yard. We added the work bench and shade system which has made it easier to garden.